Eight children were injured, two critically, after a tree fell near Kidspace Children's Museum next to the Rose Bowl in Pasadena Tuesday. PASADENA, Calif. -- Eight children were injured, two critically, after a tree fell near Kidspace Children's Museum next to the Rose Bowl in Pasadena Tuesday. Los Angeles firefighters responded to Brookside Park, just outside the museum grounds in the 400 block of N. Arroyo Boulevard at about 4:45 p.m. Thirty-three kids were participating in a summer day camp at the museum, and several children were outside waiting to be picked up when the tree fell. Museum staff, firefighters, parents and police quickly converged on the scene. "I heard a tree crack, and then I turned around and I saw little kids running, then I saw the tree fall on top of the little kids, maybe about five or seven of them. I ran over there with a bunch of parents and we just started going through the tree and the bushes and we started pulling them out," witness Greg Prodigalidad said. He helped rescue some of the children who were trapped underneath the tree and says he couldn't help but think of his own two children. "My heart was beating thinking about my own kids. I just went out there and I tried to save as many as I could," Prodigalidad said. Children were loaded onto gurneys and rescuers began cutting the tree limbs apart to see if there were other victims. Two of the eight injured children were transported to Los Angeles County+USC Medical Center in critical condition. A third child was transported by a grandparent and was said to be in good condition, according to the Pasadena Fire Department. 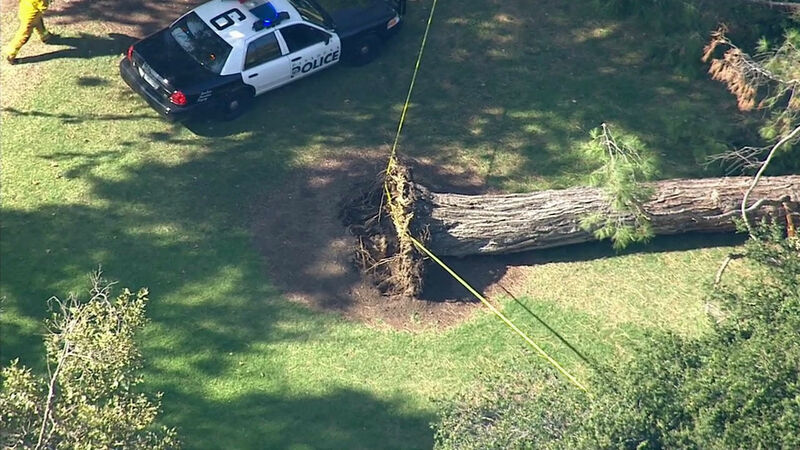 City of Pasadena officials are investigating what may have caused the 75-year-old pine tree to uproot. "Our hearts go out to the families of those injured as well as all those who witnessed this frightening incident. We wish everyone a speedy and complete recovery," said Michael Shanklin, Kidspace CEO. "I am extremely proud of our Kidspace staff, members of the community, and the first responders from the City of Pasadena for their quick thinking and help getting everyone to safety and ensuring everyone was accounted for. We are constantly reviewing our safety protocols and procedures and I am confident that diligence helped minimize injuries and save lives." At least two kids were critically injured after a tree fell near Kidspace Children's Museum next to the Rose Bowl in Pasadena Tuesday afternoon. Six others suffered minor injuries.